Anyone who has had a child who played a sport (or played themselves), knows the value of teamwork. It takes the whole team to effectively move the ball toward the goal. We can apply the same principles used to create a cohesive team to our community. Although we are individuals, we have to be able to complement each other to accomplish a common goal. An effective team pulls together the skills, experiences, and knowledge of a diverse group of people to achieve great things. What does it take to create a great team? All the members of a team must be fully committed and devote a reasonable amount of time and energy to achieving the team's goals. Each member must be able to trust that all other team members are doing the same. Mistrust can lead to petty squabbles. Team members must have open, honest communication. They must never be hesitant to communicate with other members about issues and concerns, as well as new ideas or personal observations. Bringing together people with common skill-sets typically leads to lots of discussion with little subsequent actions. Ensuring that each team member possesses a unique specialty allows the team to trust each other for certain aspects of achieving the goal, while fully understanding what their own contribution is expected to be. Team members should be able to rally together and meet new challenges head-on, rather than splintering into ideological factions or banding together to resist change. Change is unavoidable, and the most effective teams have the ability to roll with the punches and change the way they work together on the fly. By working together as a team following these basic principles, we can develop and achieve the goals that will advance Greenville forward. currently in need of donations. gloves can make a difference for someone who is cold. Pharmacy and the Greenville Fire Station. the trees filled as long as they are up. For information, call or text Holly at 724-651-2951. Beginning on May 17, work begins on the railroad crossing in Greenville. The affected intersection is near Sheetz at the Clinton, Plum and Main Streets intersection. Crews will be making their way south along the 40 mile Meadville line to the Shenango Valley. Norfolk-Southern stated, "Length of closure [at various road intersections] will be dependent on track time and/or equipment or weather-realated issues." The commercial detour for Main Street from the west is state Route 18 N to state Route 285 to US Route 19. Sidewalks are also closed; however, during the work day, work crews will assist those walking to cross the tracks. The Greenville Area Chamber of Commerce finished 2017 with a brightly lit Christmas parade with 29 units – which did not count the fire trucks that formed the beginning of the parade. What a great demonstration of community spirit! The chamber has been involved with the Christmas celebration since the 1940s. The parade was a great ending to the 70th anniversary year of the Chamber. The Chamber was also host to several other successful events, including Business & Community Expo, Grapes & Growlers, Halloween Parade, and Small Business Saturday promotions. In addition, the chamber co-hosted the Annual Auction with the United Way of Mercer County and the Business & Industry Day with Greenville Area Economic Development Corp. The chamber has been actively collaborating with the other county chambers. They participated with the Commissioners Meet N Greet hosted by Mercer Area Chamber; 40 Under 40 awards spearheaded by Shenango Valley Chamber; and a Multi Chamber Mixer coordinated by Grove City Area Chamber. All the chambers participated in discussions with other stakeholders and elected officials on how to save the State Correctional Facility in Mercer and the 400 plus jobs it represented. Greenville Chamber organized a breakfast presentation by DCED Secretary Dennis Davin, who spoke on the importance of early childhood education in industry. The chamber is more than an event sponsor. Participating with the Downtown Task Force, the chamber hosted the successful Property Showcase, where landlords opened up their commercial properties for prospective tenants, and the Greenville Chamber Challenge award. The Showcase led to the opening of Athena Study Abroad, The Boutique on Main and Ready Value Auto. The Chamber Challenge was a $5,000 award for a business to locate in the Greenville business district. The panel of judges was pleased to present the award to Seth Allison, owner of Hometown Jiu-Jitsu on Main Street. The Chamber is looking forward to new initiatives in 2018 to create value for its members, to help business prosper, and to make the community a great place to live, work and play. The Greenville Business Men’s Association began meeting in 1944. First on the agenda was to vote to take on the responsibilities of the 7-man post-war planning committee permanently, which eventually would lead them to purchase the Camp Reynolds site from the federal government. Since they were going to take on the post-war planning, they voted to also take on the responsibilities of a Chamber of Commerce. Dues were set and committees established. Among those committees was Industrial and Retail. The Camp Reynolds purchase, as well as other property purchases, was led by the Industrial Committee. It would take nearly three years for the committee to achieve their goal of purchasing Camp Reynolds from the War Assets Administration. As the purchase progressed, three individuals fronted no-interest loans to aid in the purchase. They were paid back a year later. In addition, the committee secured a pre-paid three year rental agreement from Westinghouse. A permanent GBMA committee was formed in 1950 to oversee and manage the assets of Camp Reynolds. To aid in this, a manager was hired in 1951. Another committee that was formed was the Community Chest. These were being formed all across the United States and Canada to raise money from local businesses and workers for community projects. Sound familiar? Many of these Community Chest organizations would later become United Ways. While these were the main concerns of the directors, they also involved themselves with recreation, education, housing, transportation, and veteran’s affairs. At the end of 1947, December 8 to be exact, the incorporators met. It was at this meeting, which followed the regular board meeting, that the details of incorporation from the Commonwealth of Pennsylvania were read and voted upon. While the group discussed changing the name to Chamber of Commerce in 1948, the name change would take another 26 years before becoming official in 1974. President William R. McMillen announced a new name in the 34th Annual Report & Membership Directory. One last interesting note, Ruth Martstellar was the paid “Secretary” noted in 1944 minutes for this group of businessmen who formed the association. And, it was truly all men. She would later be named Executive Secretary. In 1970, she became the Executive Director. Two years later she appears in the membership directory as an honorary member. Quite an accomplishment for a woman of this time. It's not the circus; it's a building available through the Greenville Reynolds Development Corp.
Building is 86’x272 on one side and 86’x242’ on other side. Cranes: 2 are 20 ton and 1 is 10 ton. Rail height of cranes is 22’-7”. Center to center rail is 79’-6”. Building has 32’ eaves. 28’-9” clearance under frame. Click here for a picture of the building. Well, it's almost here: the 66th Annual Business & Industry Day at The Greens of Greenville. Image having the privilege of coordinating the longest running community event of its kind. I hope that I make the day as enjoyable as previous years. While the event has seen many changes over the years, this is still a great outing to bring together business and community leaders in a relaxed atmosphere. While the weather may prove unkind, it's the one thing we can't control. We still plan to have an enjoyable day. We see teamwork on the course, but there is also teamwork behind the scenes. The success of B&I Day is due to the continued support of our sponsors, players and volunteers. This year's Birdie Sponsors are Greenville Savings Bank and UPMC Horizon, and our Par Sponsor is ILSCO Extrusions. Many hours go into planning an event of this caliber, I feel a sense of accomplishment when I witness everyone having a good time. It is encouraging to see the many people who support the initiatives of the GAEDC and GACC. Proceeds help us with the vital mission of promoting economic development and community promotions. Sunshine laws, also known as open-meeting laws or public-records laws, support government transparency and accountability, allowing citizens to know what goes on when government officials transact public business. As the majority of county municipalities, the Borough of Greenville holds a council work session and a regular council meeting, and both of these meetings are open to the public. Regular council meetings are held the second Monday of the month with the work session held the previous Thursday. According to the law, advance notice of the meetings must be given. The Record Argus publishes meeting dates on the bottom left corner of the front page. The Borough also posts the dates on their web page under the "Borough Information" tab. There is a link on the home page that directs users to a portal containing agendas and minutes from previous meetings as well as other public documents. An important differentiating note here is that deliberation surrounding motions occurs during work sessions, and the actual vote happens at the regular council meetings. Public comments are heard at the beginning of the meeting and then again at the end of the meeting. However, any comments given at the end of the meeting must pertain to agenda items discussed during the meeting. If you are attending a regular council meeting and want to voice a concern, visitors have the floor during the beginning of the meeting and are each given five minutes to speak. Local government is for everyone. Local government is responsible to its citizens, and they want to make sound decisions regarding community needs and the best use of resources to create a sustainable community. American Legions and VFW Posts with volunteer help spend hours placing flags and markers on our veterans' grave sites in preparation for the upcoming Memorial Day holiday. We all realize it's more than a three-day weekend, but a day to remember those that have fallen defending our freedom. Memorial Day is not to be confused with Veterans' Day; Memorial Day is a day of remembering the men and women who died while serving, while Veterans' Day celebrates the service of all U.S. military veterans. Memorial Day has been around longer than any of us remember. It started as "Decoration Day" in the late 1860's after the Civil War. More than 600,000 Americans died during the Civil War, and both North and South wanted to commemorate them. Under the leadership of women during the war, an increasingly formal practice of decorating graves had taken shape. In 1865, the federal government began creating national military cemeteries for the Union war dead. Many cities claim to be the birthplace of Memorial Day including, Charleston, SC; Waterloo, NY; Boalsburg, PA; Carbondale, IL; Columbus, GA; and Columbus, MI. In the years following the War Between the States, the North and South held various ceremonies to honor the fallen Union and Confederate soilders. In 1868, Commander in Chief John A. Logan of the Grand Army of the Republic issued what was called General Order Number 11, designating May 30 as a memorial day. Beginning with Michigan in 1871, states passed laws making the holiday official. May 30 was chosen as it held no particular relevance to any battle, and flowers would be in bloom for the decorating. However, it wasn't until 1971 that Memorial Day was declared a federal holiday by an act of Congress. It was then also placed on the last Monday in May, as were some other federal holidays. Memorial Day is celebrated differently in communities across the nation; however, all Americans are supposed to pause for a minute of silence at 3 p.m. local time to pay tribute to the men and women who died while serving the nation. Congress instituted this practice in 2000 with the passage of The National Moment of Remembrance Act, so this is one Memorial Day activity that is actually the law. This semester I interned at the Greenville Area Chamber of Commerce. This was a spectacular way for me as the Junior Chamber President and a college student to get involved in the Greenville community. As the intern I worked at least twice a week in the office under the direct supervision of the Office Manager, Janice Schwanbeck. I worked with her on several projects including the annual Community and Business Expo, Chamber Annual Auction, several seminars, special events, and other projects. All of these projects involved preparation work, including spread sheets of those involved, planning of the actual event, and implementation ideas the day of. For example for the business expo, I created spreadsheets displaying where the businesses were located within the Thiel Dome. Throughout my internship I also worked on expanding the chamber's business perks program, which are discounts and offers chamber members offer to each other. While I have been working on this project, I added ten businesses to the perks program which gives a direct benefit to the chamber membership. I have also coordinated contracts with five amusement and theme parks to give group rate discounts to the chamber members as another added benefit. By attending the events in the evening such as the 40 Under 40 recognition and the member refresher, I gained so much knowledge in how business owners interact with one another and how I can network with others better. Additionally, I helped create a new unique relationship with Thiel College, who is assisting the chamber with the Business Next Door video series. This partnership will continue to benefit both entities now and into the future. Being an intern at the chamber was an amazing experience that has allowed me to gain knowledge in so many different areas. This has been such a positive experience for me, and I look forward to applying the skills I have learned in my education and into my future career in business. One of the benefits of Chamber membership is the opportunity for business networking. The power of networking cannot be underestimated. Networking is about building and maintaining relationships. It's a personal form of communication that helps people build trust. Networking is a skill. Amassing business cards isn't networking. Quality is more important than quantity. Direct your networking toward cultivating personal connections. Once you make a new connection, you need to leverage it by following up with the person. The follow up is what creates the connection. Write notes on the back of a business card about your interaction; then use those things to create the follow up. While social media helps people make connections. it's not a substitute for traditional face-to-face networking. Social networks like LinkedIn and Facebook allow you to connect to hundreds of people and most likely interactions with these connections is limited. The power of networking lies in how well people know you, how much they trust you, how much they gain from having you in their network, and how often you communicate with them. Networking can happen anywhere. Arranging meetings and workshops, attending seminars and conventions, running conferences and ceremonies, and serving on a board of directors or on a committee are all excellent ways of meeting other industry professionals. Engaging with people, leaving a great impression, and staying in touch will provide you with future business opportunities. The term “chamber of commerce” is a widely known organization that is associated with business. But really what does this organization do? The Association of Chamber of Commerce Executives defines this phrase as “an organization of businesses seeking to further their collective interests, while advancing their community, region, state or nation.” (acce.org). The chamber of commerce is the major support system of community businesses, bringing all types of industry together to achieve a common goal. Having large and small businesses working together to improve the region is what provides not only strength to the commerce of the Greenville area, but it is what makes communities stay strong and grow. The more members the Chamber has, the better we can represent the business community. We accomplish collectively what no business could do alone. The Greenville Area Chamber of Commerce relies upon its members to participate and make the community stronger. Through events, seminars, and community gatherings the chamber offers so many different opportunities for individuals and businesses to meet new people and improve their networks. The wide variety of events, when taken advantage of, can greatly improve your business and open you to opportunities that are only available with your participation in this chamber. The Greenville Area Chamber of Commerce is promoting businesses throughout the region, it is you who must decide if you want to join and reap the benefits or watch from the sidelines. Film Location in Norther Mercer County? Anyone? We are looking for a gas station in the middle of nowhere. Strongly prefer that it is closed so it can be controlled since it is the central location for a feature film. If you know of something like this, please send me address and photo if you can. Scarecrows on Main 2015 Winners! Over a year ago now there was a group of chamber members and concerned small business owners who came together to talk about what it means to do business in a small community. These business owners are some of the most generous people this area has to offer, always giving to important causes and supporting local sports teams or other youth oriented activities. There is a cycle that is supposed to work. Many of these businesses were starting to notice a dangerous shift in mindset that was throwing off the cycle that is supposed to work. This cycle is so dependent on all the parts to work that it is difficult to pick which part to start with, since all of them are equally important. Let's just start with Building A Better Community. This first step, is really an ongoing goal, the idea that keeps the cycle turning. It's what should prompt the community to act and should be a conscious business decision. 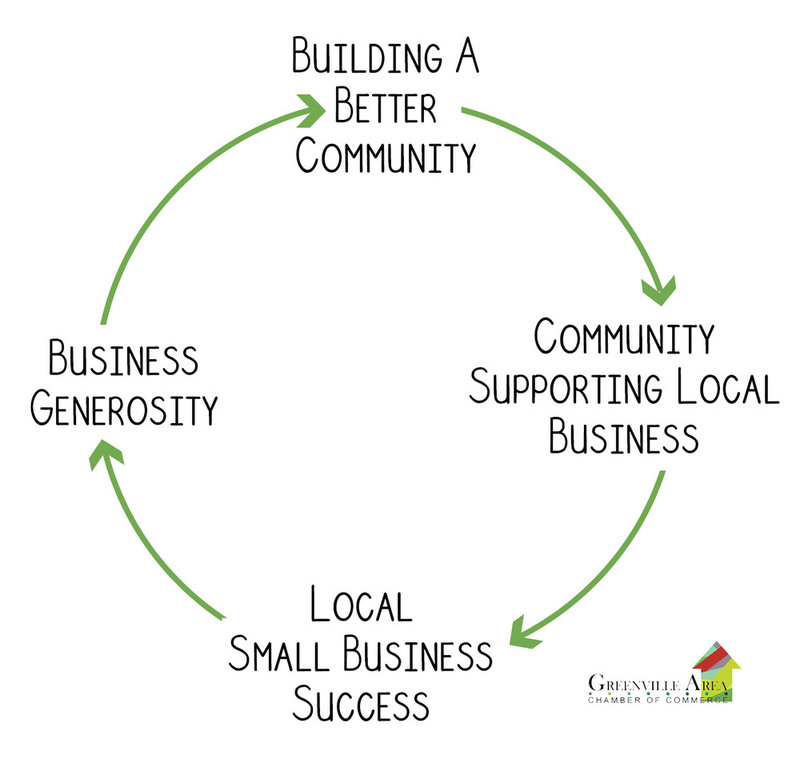 In this cycle Building A Better Community directs the community in supporting local businesses. These businesses are what make our community unique and they notoriously keep local dollars spent local. With the action of the Community Supporting Local Business we start to see Local Small Businesses Succeed. They may be able to employ more people or they might be able to improve local infrastructure through repairs made to their building. But ultimately Local Small Business Success should lead to those Businesses Generously giving to their community. The cycle can grow and blossom and have profound impacts. But does this happen here? With the Main Street closed many of our small businesses that occupy our downtown are feeling the pinch. Sales are down, way down. Joe & Jenn of Padrone's Pizza & Pub have a business downtown that has been greatly effected. They have, however, also experienced something tremendous during this difficult time: the cycle at work. Some of their best customers have reached out and have showed up during this time of need. A local patron recently came and bought hundreds in gift cards to give to co-workers this Christmas and decided to all bless the hard-hit serve staff and bar tenders by leaving a hefty tip. Even a local "Big Bad Corporation" ordered a large number of pizzas to feed their staff, saying something along the lines of, "you guys have always been good to us and we want to help you out." This is community at work, this is the cycle making its way around to complete the circle. Joe and Jenn believe the out pouring from their patrons and from the community can be attributed to their efforts of supporting the community over the past 10 years they have been in business in Greenville, PA. Recently in a meeting with other downtown businesses, Joe mentioned the need of addressing the community in starting local. Unknowingly, what Joe is proposing is the very thing those businesses first mentioned were working on. We are having our "for such a time as this" moment. It's about educating both businesses and community with the hopes of creating good locally minded habits. We understand that our local small businesses do not have everything and will not meet all of your needs, but the idea behind it is in the name, we should at least "Start Here". Start local and get what you can from your small businesses... make that part of your routine. There are many reasons why Buying Local Matters. Keep an eye out for campaign materials sharing those points. They will be on posters, post cards, and businesses cards for you to keep in your wallet as a reminder. Creating habits like starting local before your go some where else is not easy. It is sometimes changing years and years of "convenience" excuses and apathy. But why don't we start finally? So let's start here. We need you! It's time! It's happening! If you are interested in helping make the Road Block Bashes a success, please join us for a special meeting at the Chamber of Commerce today, Wednesday, September 9th at 5pm to discuss how we can make the most of these events! We need people who both have great ideas and who are doers!! There is also a Greenville Downtown Business Association meeting at Steph's Corner Pub & Grille on Monday, September 14th at 8:30am to plan for the events as well. We hope that you will come out and join us in making the most of this road closure and are excited for the opportunity to make this happen!